A "meme" is a way of describing information that spreads from person to person like a virus. This concept was the subject of the second lecture I gave on the EBM course that I'm teaching at UCT. It is theorized that the information comprising these memes influences our thoughts and behaviour to the extent that they are ultimately the transmitters of culture among people. I have found that Memetic theory can be usefully applied to helping our business strategies be understood and applied. It is also useful to understand the concept of a "meme" when structuring word-of-mouth/mouse marketing campaigns. Memes tend to cluster, into groups of memes that are called "memeplexes" (or meme-complexes). An example of a memeplex, for example, could be a company which comprises elements such as it's brand, it's business processes, its work ethic, financial structure, and even its clothing conventions. Just as the most successful genes in any species are those which are passed on from generation to generation without mutation, so too are the most successful memes those which are passed from person to person without being fundamentally altered. Put simply, Success, in both the case of memes and genes, relies on replication. Even the strongest person's genetic make-up will be diluted in the process of reproduction with another person. Strong memeplexes, on the other hand, may outlive their creators. Plato's genes, for example, have been diluted for generations; but his ideas have lived on through the ages with integrity, despite being translated into many different languages. Existential issues aside though, successful Commerce, Leadership, Management, and Power rely on the ability of our memeplexes to be replicated successfully among key stakeholders (such as your staff, or your customers). I would suggest that you are more likely to make a real difference if people adopt memes which cause them to act in a way that enable that difference. We need to be aware of what memes we are passing on, and ensuring that we aren't passing on memes which undermine our greater purpose (be that our Life's Purpose, or simply our company's objectives). The online space is, of course, one of the best platforms for memeplex distribution, since it allows for easy replication of memes (be they pictures, articles, songs or software). One of the challenges for businesses operating online is to ensure that they aren't too heavily invested in ensuring that their product or service isn't copied. In many cases it makes far more sense to assume that people WILL copy your work, and to esnure that you still stand to benefit in some way from that - for example by using that as an opportunity to sell value-added services. The video I played in class was of Dan Dennet speaking at TED about Ants, terrorism, and the awesome power of memes. In it he mentions how the germs brought by European explorers wiped out native populations who hadn't developed immunity to them. He draws a parallel with how one culture's toxic memes around (such as pr0n0gr4phy or sm0k1ng), around which cultural defense mechanisms (immunity) has been developed, can destroy other cultures. And bearing in mind that there are ideas (or memes) that people are prepared to die for, that this can cause real problems and real conflict. This will be touched on in more depth in the upcoming lectures on the effects of Globalization. The other video that I played was of Seth Godin's talk at TED where he speaks from the marketing perspective about how "ideas that spread win". He talks about "remarkable" ideas (those ideas worth remarking about to another person) as the most successful ideas in a hyper-connected economy. This alludes to the subject of Viral Marketing. We highlighted the importance of organizational storytelling in this context. The impact of particular stories on each of our lives may be something that we will explore in tutorials. Issues of Morality will be dealt with in subsequent weeks, but at this stage it is important to simply acknowledge that our culture, products, and actions are imbued with ideas and stories (memes). It is also important to be aware of that much of your own behavior today may have resulted from memeplexes which you have adopted as your own in the past, when your critical defenses (or immunity) was not fully developed. As an experiment, Eric's creating a list of SAbloggers who link to his popular Mobile Q&Asite. Offer a prize in return for people linking to you from their blog or social-networking page. Set criteria - e.g. "Valid for first 100 mentions only"
Tell the blogger to notify you when it's up. Follow through on your promise of reward. You can really get creative with this structure - for example, by asking people to create their own banner ads as links for the promotion/competition. Do you think that this type of promotion will pollute the conversations happening in the blogosphere? Fast Company spoke with trend experts to create a slideshow called "Top Jobs in 2007". "Not to be confused with someone in advertising or public relations, a viral marketer knows how to build an audience from nothing with little more than rumor and excitement. 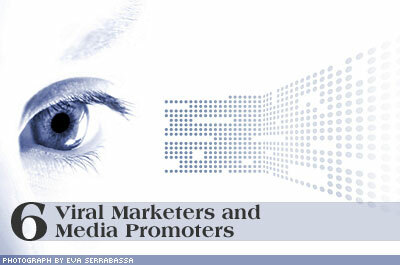 Viral Marketers begin "contagious" campaigns that spread largely through word of mouth and the Internet"
If this really does take off, then traditional media has another reason to be concerned, because alot of online viral marketing goes through unpaid channels like email, YouTube and blogs. This would mean more money going to intelligent marketing strategists at the expense of media owners. A focus group Moderator is a master of conversational guidance and flow. She has a very short time to get raport with a bunch of strangers, and then get all of them to discuss their feelings, anxieties, frustrations and the depth of their convictions around a particular topic. For some people that takes years, but a good moderator get to the heart of it in under an hour! The Chain Reaction: Build a cumulative effect by encouraging each member of the focus group to comment on a prior idea suggested by someone else in the group by adding to or expanding on it. Devils Advocate: Express extreme viewpoints to provoke reactions from the group and keep the conversation moving forward in a lively manner. False Termination: Falsely conclude the discussion, thank the group for participating, and inquire whether there are any final comments. These "final comments" frequently lead to new discussion avenues and often result in the most useful data obtained.